Earlier this year, many made a big deal about the fact that last year, for the first time. the Fidelity Charitable Gift Fund as a single entity took in more donor money nationally than the United Way did. With much fanfare, a new “charity champion” was declared. This struck us as not much of a revelation; the two types of fundraising (donor-advised funds and workplace solicitations) as “forms” crossed paths a while back—one ascending and one descending—and Fidelity’s just one among a expanding number of umbrellas for donor-advised funds. At the time, we suggested the United Way was not the only workplace-solicitation entity experiencing a decline; technology and societal trends make direct giving easier and render more intensive intermediation a potential waste effort and donor dollars. So, as the year went on, we’ve been watching to see what’s occurring elsewhere—for instance, in the workplace giving campaign for federal government employees, operated through the Office of Personnel Management. 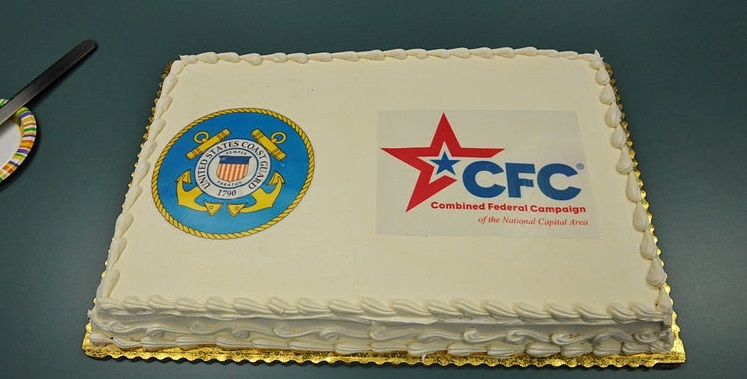 The Combined Federal Campaign (CFC) was supposed to have wrapped up its 2016 campaign last week. As one indicator, which may presage the whole national campaign, we note that the Combined Federal Campaign for the National Capital Area set a reduced goal of $47 million this year after it raked in $46.5 million last year against a goal of $50 million. The workplace solicitation campaign for federal workers is international (including the military), but the National Capital Area is its highest giving area. Its campaign was set to run from September 15th through December 15th, but on December 5th, the Federal Times reported that the giving deadline was to be extended through the end of the year. And then on Monday, December 20th, Mike Causey of Federal News Radio reported that pledges as of a day or two before amounted only to $34 million. So, unless that campaign can raise $1 million a day through the end of the year, the campaign will fall short of its more modest 2016 goal. The second improvement allows for Federal employees to volunteer with charitable organizations, and for those hours to count towards CFC goals. 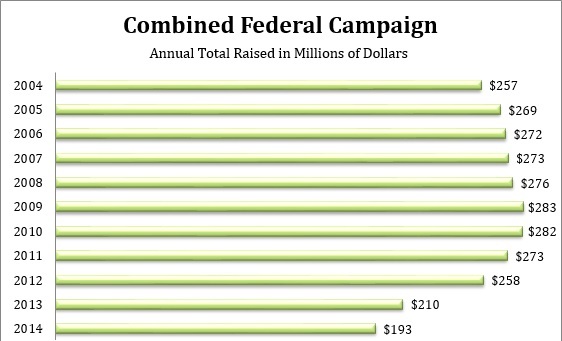 For example, many campaigns and Federal agencies set fundraising goals. Instead of being allowed to only contribute money, volunteer hours will be “monetized” and will count toward the total amount raised. In order to monetize volunteer hours, an estimated value will be given to one hour of volunteer time, which will be used to calculate the total value of volunteer time given by a donor. There may be a surge of giving before the end of the year, ensuring all will be well for this year’s CFC campaign. In general, though, I think we may all want to accept that, although many have tried hard to reverse the course of this decades old campaign, the CFC may not be a growth enterprise–type right now. SPECIAL REPORT: The Ailing CFC: One More Canary in the Workplace Giving Coal Mine? The rapid plummeting of the Combined Federal Campaign’s workplace fundraising has continued unabated despite many attempts at reform, but is that because it is irrevocably fated by the times or because the program has failed to listen even in reform mode?